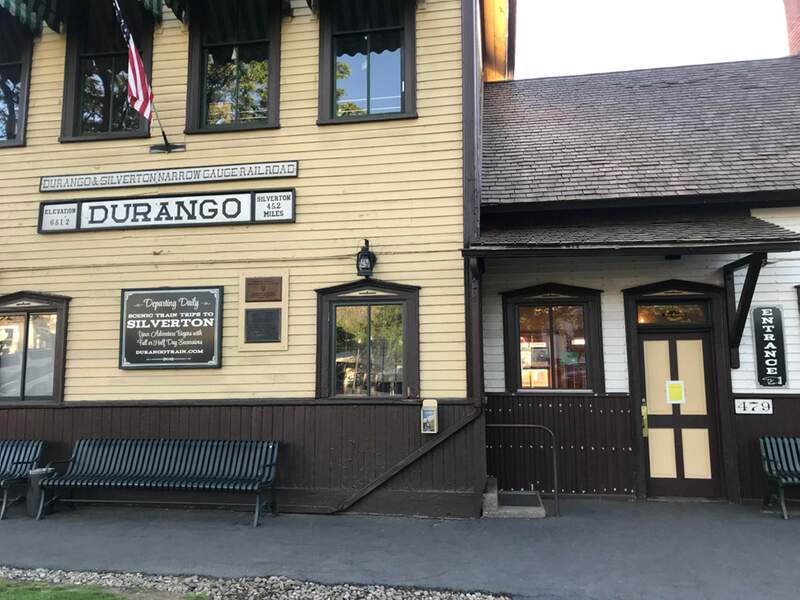 The Durango & Silverton Narrow Gauge Railroad has furloughed 150 seasonal employees and could face a potential 31,000 cancellations for the month of June if service to Silverton does not resume. The economic costs of the 416 Fire are adding up. The Durango & Silverton Narrow Gauge Railroad has furloughed 150 seasonal employees, Purgatory Resort has canceled several weddings and group gatherings and has been closed since Friday. Blair Street in Silverton is largely vacant of foot traffic. John Harper, general manager of the D&SNG, said if the train is closed for the month of June, the train’s second busiest month after July, it will deliver a $33 million hit to the local economy. The train is reviewing a potential 31,000 cancellations for the month of June if the fire continues to block daily runs to Silverton. So far, the train has canceled about 15,500 reservations through June 17, Harper said. Ken Boden, who has owned Handlebars Food & Saloon in Silverton for 29 years, said Greene Street is still getting some foot traffic, but Blair Street is dead. Boden said Handlebars, 1323 Greene St., is one of the few business that finds it worthwhile to remain open. Tim Selby, owner of the Shady Lady, 1154 Blair St., said he is considering going to his winter home in Bullhead City, Arizona, for the next month because it’s so slow in Silverton. “Nothing’s going to change until it rains. That’s the bottom line,” he said. “There’s no reason for me to be here when I can go home to my girlfriend and water ski for a month. The Glacier Club, which includes 140 homes and a golf course on 1,000 acres in the San Juan National Forest, is paying its 150 employees, 100 of whom are seasonal, 100 percent of their salaries during the evacuation, said Erin Allen, a communications consultant with the Glacier Club. A safety team that varies in size, but usually is about four employees, is on the grounds running irrigation systems and patrolling for any suspicious activity such as lights that remain on and checking for open doors in association with the La Plata County Sheriff’s Office. Harper said he is working with the La Plata County Emergency Communications and Operations Center and the Community Foundation Serving Southwest Colorado to develop a program to provide some assistance to furloughed seasonal workers. Setting an end date for the D&SNG’s furloughs is dependent on the efforts to control the fire so that daily train operations are safe to resume, Harper said. “We have no date on when we can resume service with diesel locomotives. We are working with local agencies and the Forest Service to find out when we can do that,” Harper said. In June, the train normally makes three to four runs to Silverton a day based on bookings, he said. The train is examining making runs to Silverton using its four diesel engines, he said. However, the diesels can pull only three or four cars to Silverton compared with the 12 cars the steam engines can pull up the 4,241 feet in elevation to get to the mountain town. The train has six coal-fired steam engines. The lost revenue from cancellations in June will also decrease the $300,000 to $400,000 in charitable giving the D&SNG makes annually in cash or donated tickets to nonprofits, he said. “Because of the fire, those donations will be impacted as well,” Harper said. While Purgatory Resort plans to reopen from 10 a.m. to 4 p.m. Friday through Sunday for limited activities on the Plaza, Kim Oyler, spokeswoman for the resort, said the plan is contingent fire conditions and could change based on conditions. Should conditions change, Purgatory’s operations may be suspended at any time, according to a news release issued Wednesday by the resort. “It has been a challenging year, both winter and summer, but we’re making the best of it,” Oyler said. Purgatory’s priority is the safety of its guests and employees, said Colin McBeath, general manager at Purgatory Resort, in a news release. “We have a commitment to our 250 employees, and our goal was to get them back to work so they could support their families and livelihood,” McBeath said. Oyler said she did not know if any employees at the resort had been furloughed. Purgatory Resort has also opened its grounds to house the 416 Fire’s Incident Command Center. “We’ve made our facilities available to them and are committed to supporting them with whatever they may need. We appreciate all that they are doing to keep our community safe,” McBeath said. Purgatory’s management team has been working with officials involved with the wildfire, including the Forest Service, local law enforcement, county officials, Colorado Department of Transportation and others to determine a re-opening schedule, according to the news release. parmijo@durangoherald.comAn earlier version of this story erred in saying Purgatory Resort would reopen when the fire was under control. Purgatory Resort said it will open for limited activities, but the opening is dependent on fire conditions. Donations are being sought to bolster the Community Emergency Relief Fund to help people in Silverton, Durango and Southwest Colorado who have been furloughed because of the 416 Fire. The fund, administered by the Community Foundation Serving Southwest Colorado, currently has $30,000 available. But the foundation would like to augment that substantially given the scale of economic harm caused by the fire, said Briggen Wrinkle, the foundation’s executive director. To donateMail a check to the Community Foundation Serving Southwest Colorado, P.O. Box 1673, Durango, CO 81302.By PayPal or credit card at the foundation’s website at www.swcommunityfoundation.org. Do you know someone whose employment has been affected by the 416 Fire.